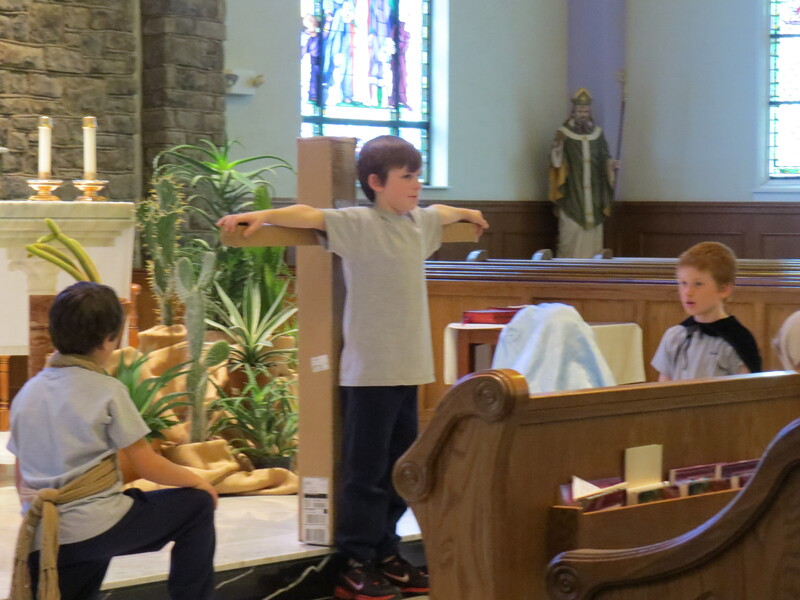 Grades 4-8 took turns leading the Stations of the Cross during this Lenten Season. The 7th grade did an incredible job writing their own Stations, prayers and reflections. They also provided visual images for us to reflect upon. 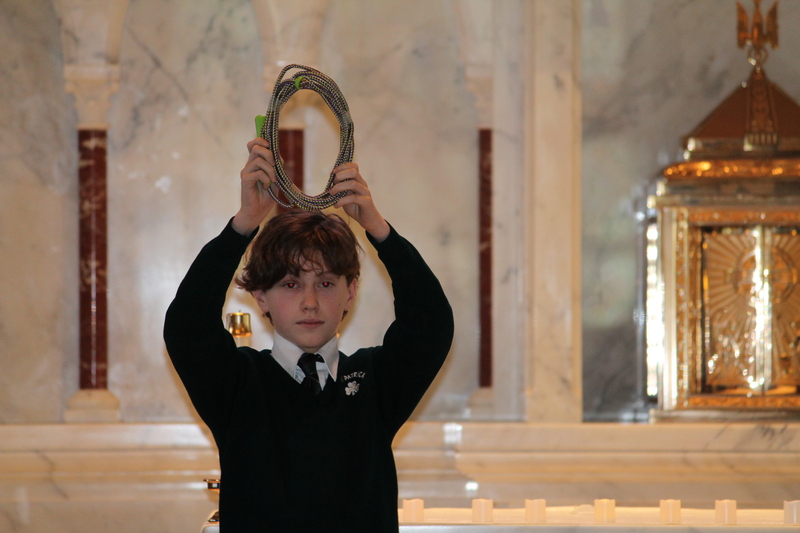 For instance, for the 1st Station, a student brought forth coins because Jesus was sold out by one of his friends. A small replica of a cross represented the 2nd Station. A rosary represented Jesus meeting his Mother, Mary. A box of tissues represented the women of Jerusalem weeping over Jesus. The visual representations stayed in all of our minds and helped us to focus on Jesus and the suffering He endured for us. Thank you to all of our grades for leading the Stations. 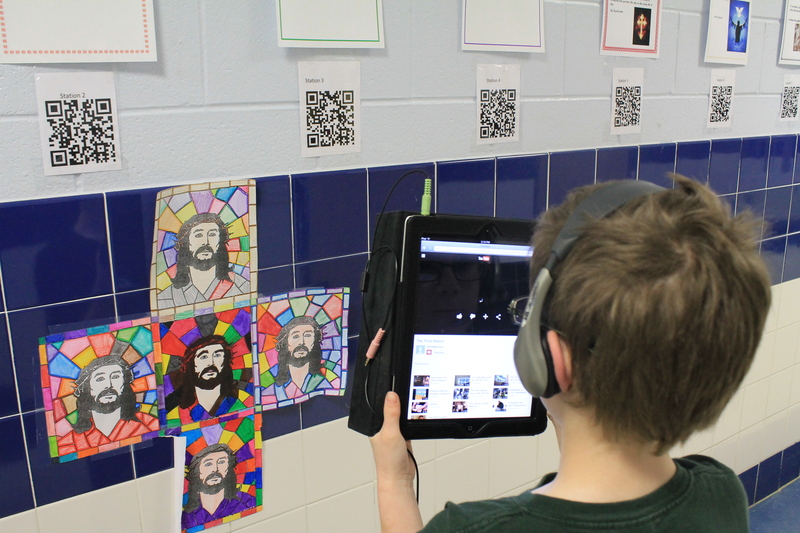 The diversity of styles, prayers, and ideas helped us along our Lenten journey these past 40 days. Awesome job, First Grade! Go Warriors! 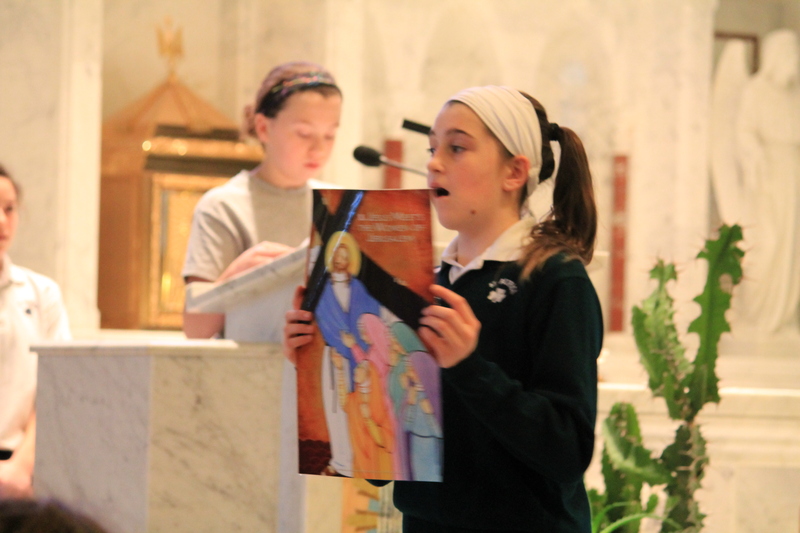 Students in grades 2-8 participated in our Lenten Prayer service yesterday. The focus of the service was a reading from Ezekiel. In this reading God promises a clean heart to all those who repent and asked to be saved – and, God promises to always be our God! 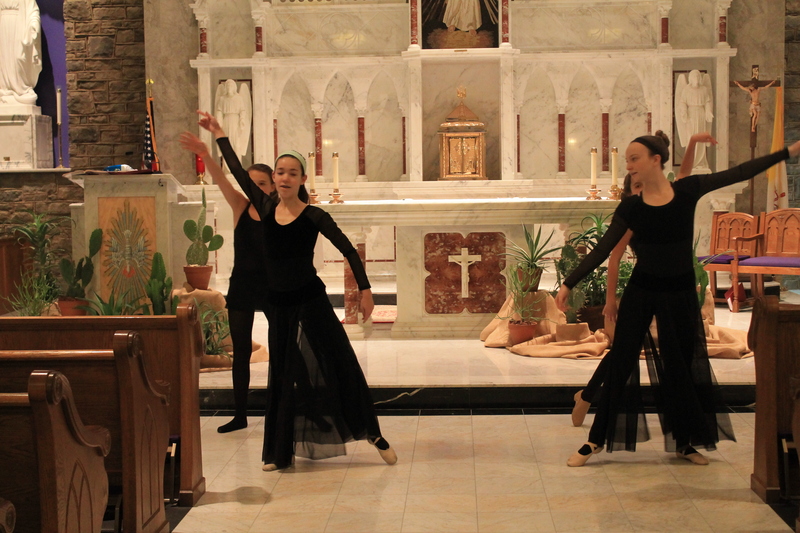 A wonderful part of the prayer service was a liturgical dance by four of our girls. They danced to the song Why? by Michael Card. 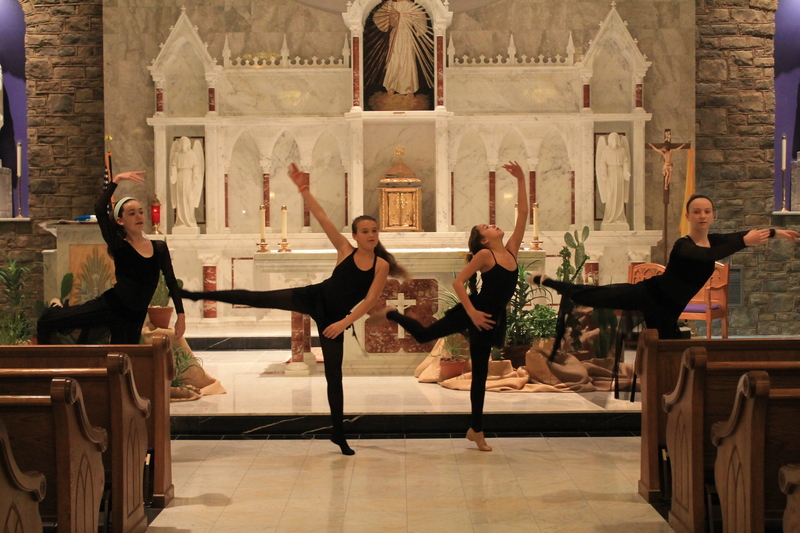 The girls were beautiful and their movements so prayerful. They provided us with another way to pray and communicate with God. 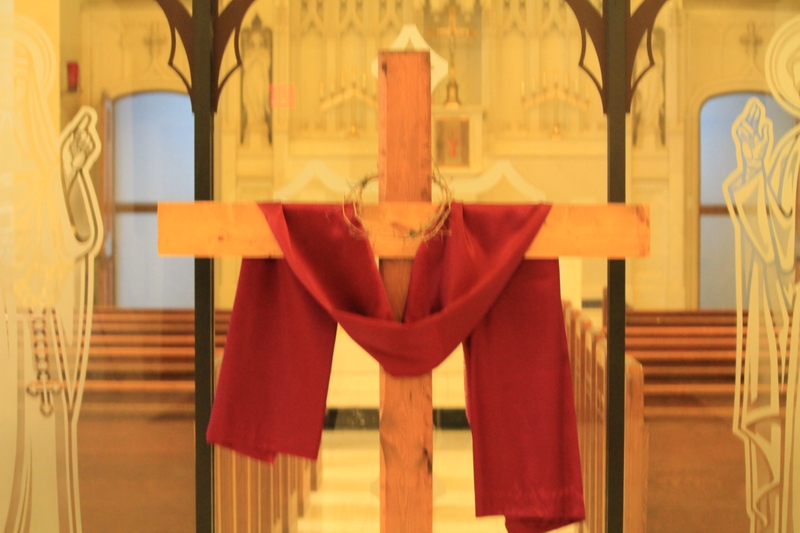 Now we prepare our hearts for Holy Week and the joyous Easter Season! 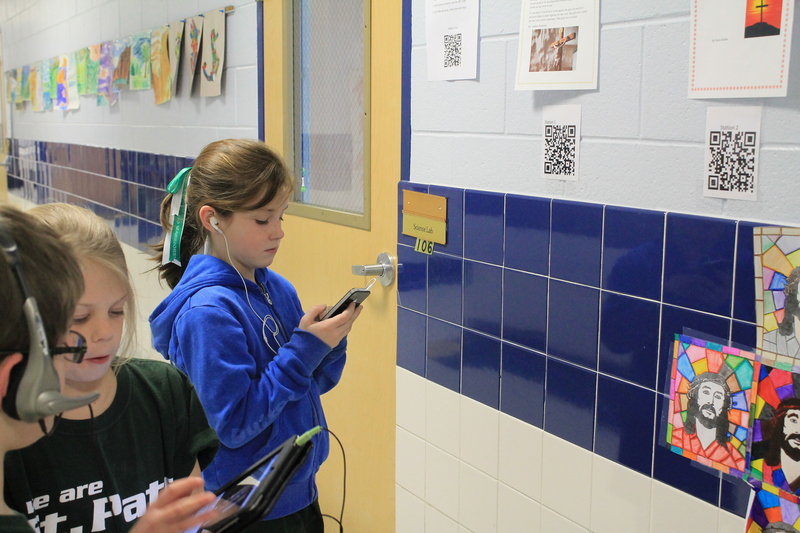 What’s in a QR Code? 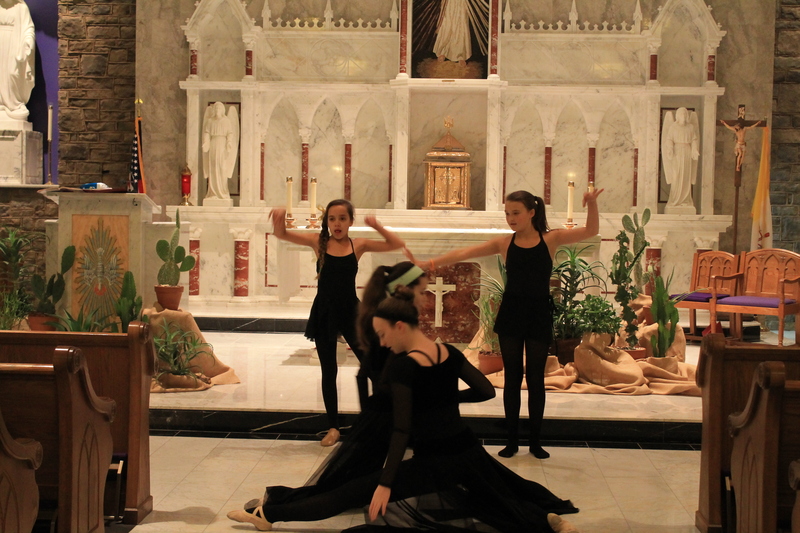 3rd, 5th, and 8th graders have been working together to write their own interpretations of the Stations of the Cross. After they finished the reflection and writing pieces, they took to the filming studio of the church to record their thoughts and prayers. But, how to share this great work with a broader public??? 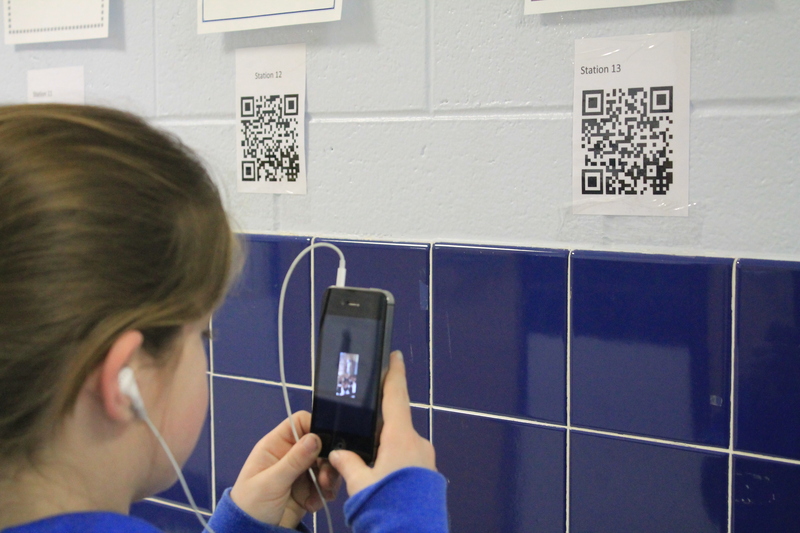 Hmmm – what about using QR codes to post with each Station? 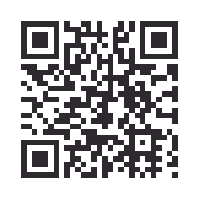 The code could be scanned and people who visit our church, school, website and Facebook page could scan and listen to the 15 Stations at their leisure! This would be a great way for us to pray together, especially with Holy Week coming soon. Thank you, 3rd, 5th, and 8th grade students and teachers as well as our Technology teacher! Thank you for helping us find another way to pray during this Lenten Season! Go Warriors! 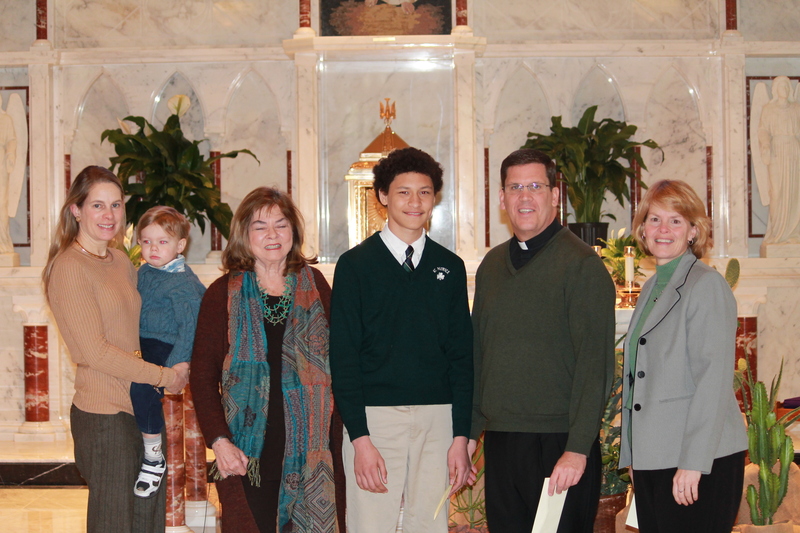 St. Pat’s Congratulates Damon Caron – Neumann Scholar! 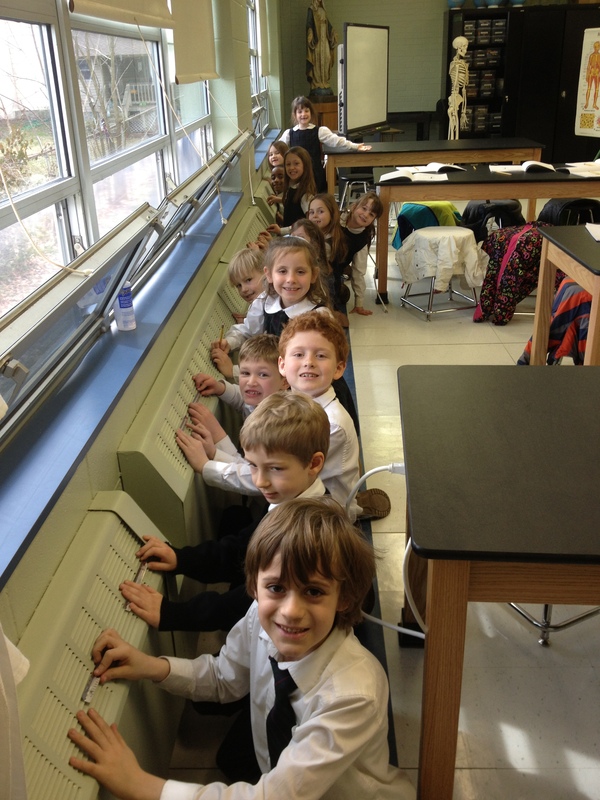 It is a great day to be Irish – or, it is a great day to be at St. Patrick School on this St. Patrick Day weekend! Congratulations to Damon Caron for becoming the 3rd St. Patrick student in 3 years to win the prestigious Neumann Scholar Award. 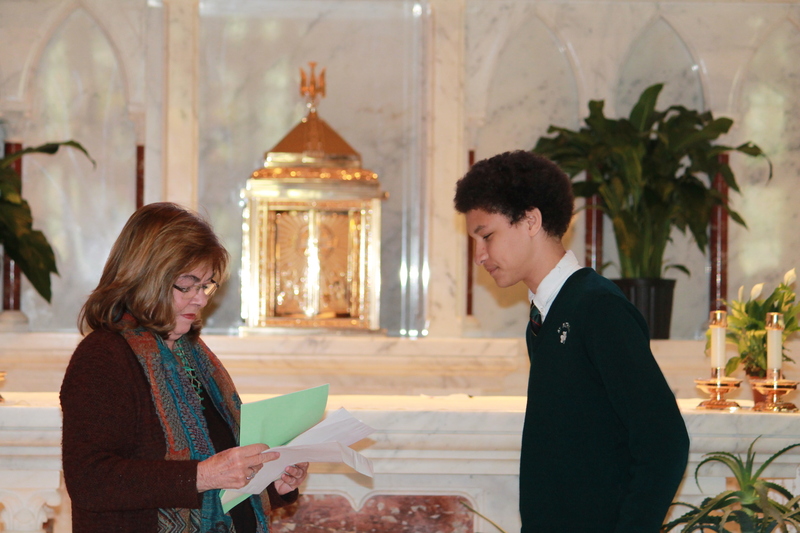 This scholarship provides 4 years of full tuition to an Archdiocesan high school as well as endless counseling, advisory, and college placement help in the upcoming years. 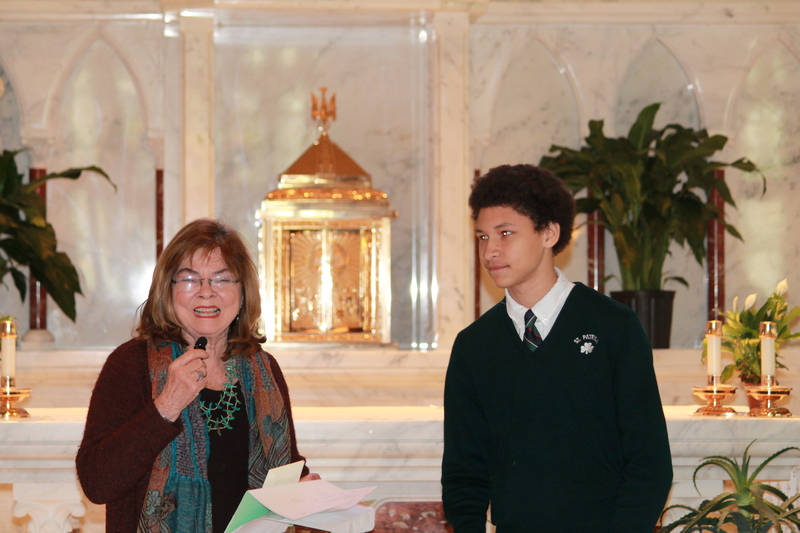 The scholarship is funded by the Connelly Foundation and today St. Pat’s was honored to have Mrs. Emily Riley, a Connelly daughter and Foundation Trustee make the announcement and present the award to Damon. Damon, we are so proud of you. To repeat how some of his classmates described him: humble, a hard-worker, a good dancer, plays the saxaphone, a man of his word, a fast runner. Go Damon and Go Warriors! The Connect Four tournament was intense! Showing their moves during Just Dance competition. 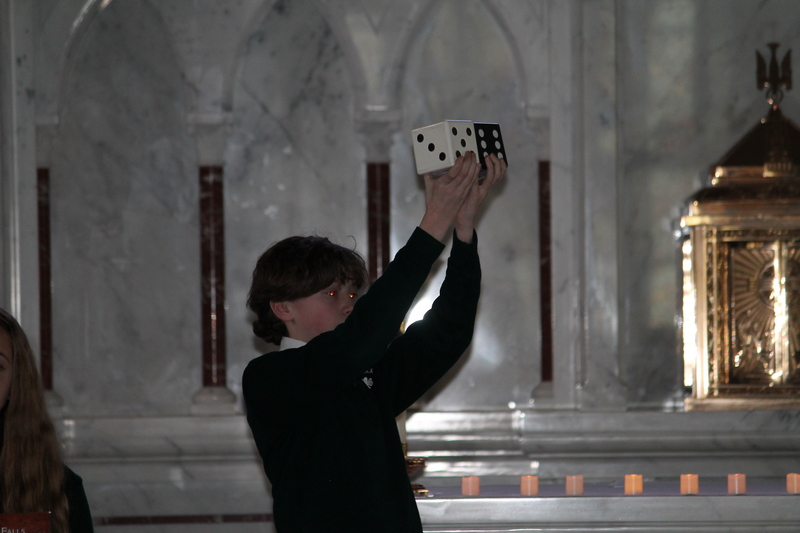 The 2nd round of our House challenges were in full swing this past week. 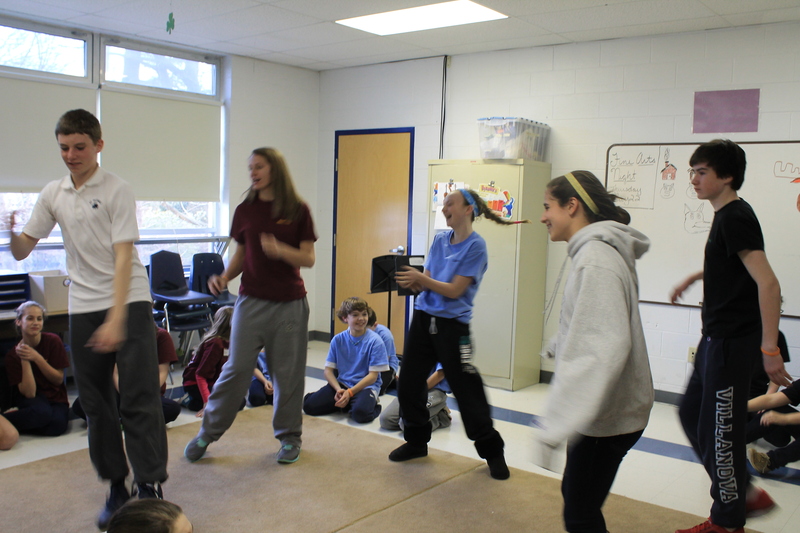 Students in grades 5-8 competed in Just Dance, Reverse Charades, Connect Four, Jenga, Freeze Dance and a 5 on 5 basketball tournament. This round of challenges was organized by the House reps which allowed them to use some leadership and organizational skills. 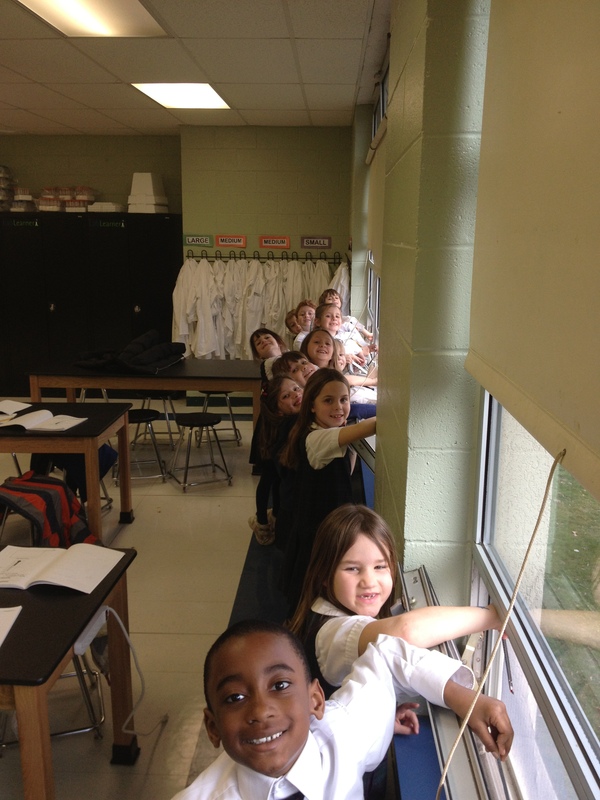 Our five Houses are: Drexel, Neumann, Cabrini, Seton, and Kolbe. 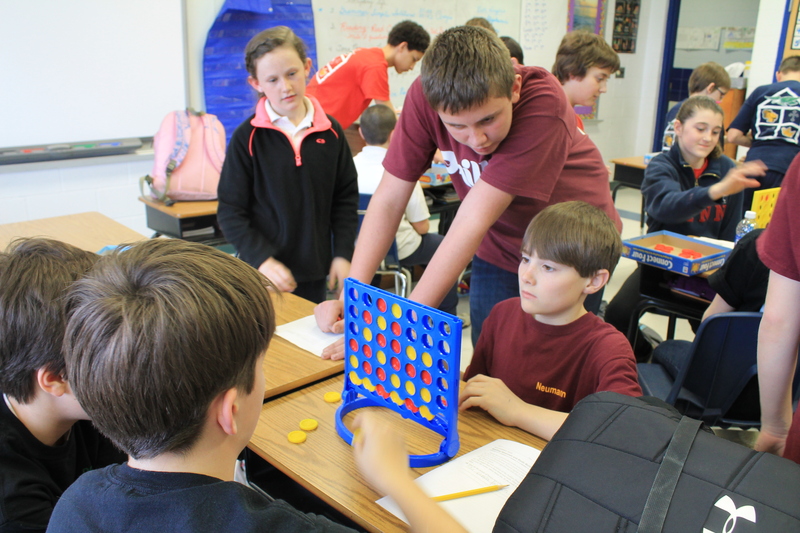 We meet for one period every Thursday afternoon to discuss topics relevant to middle schoolers, listen to a speaker, perform a service activity, or have fun during our House challenges. 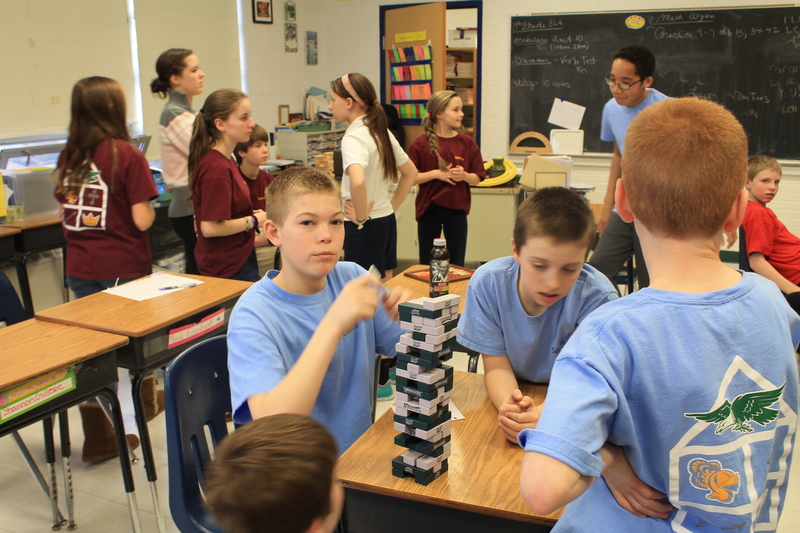 Cabrini took the Jenga challenge seriously! 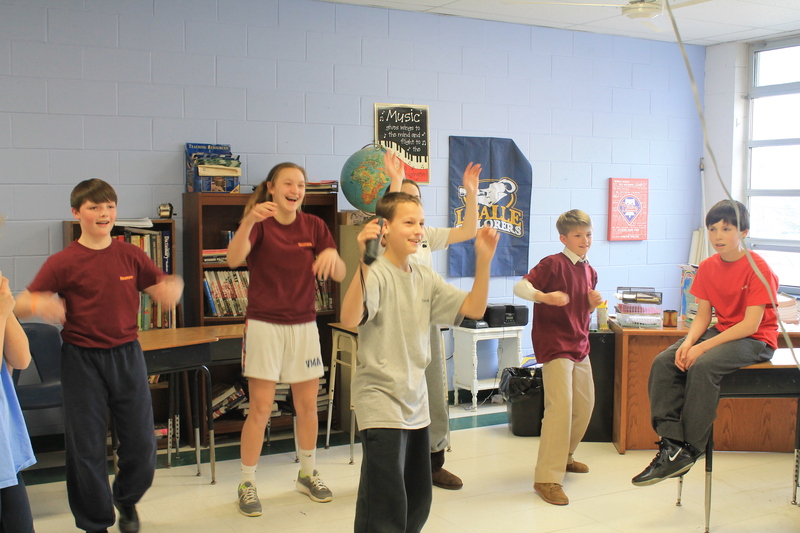 Freeze Dance is an all-time favorite! 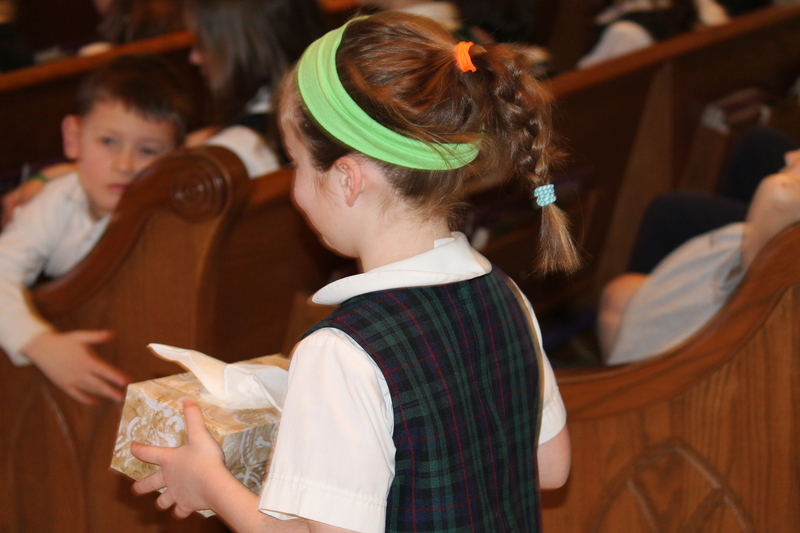 Lenten Practices are Strong at St. Pat’s! 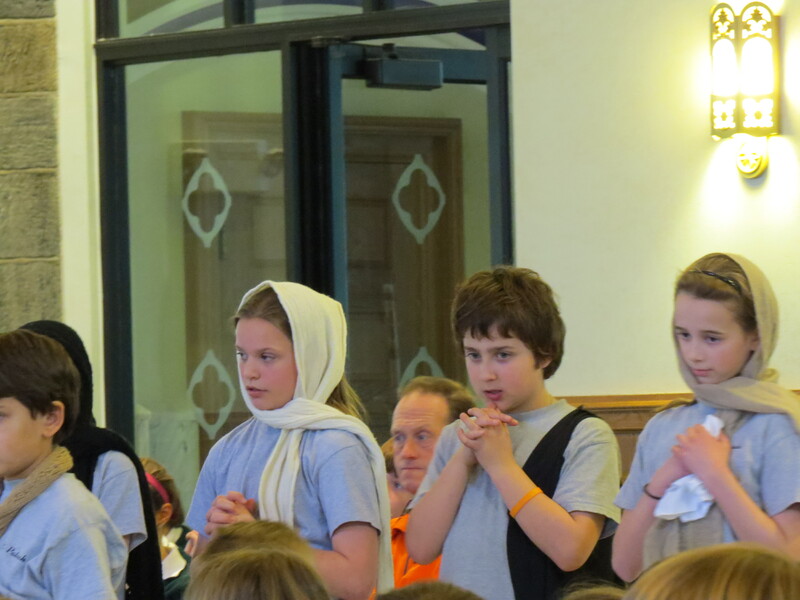 The Lenten Season is in full swing here at St. Patrick School! 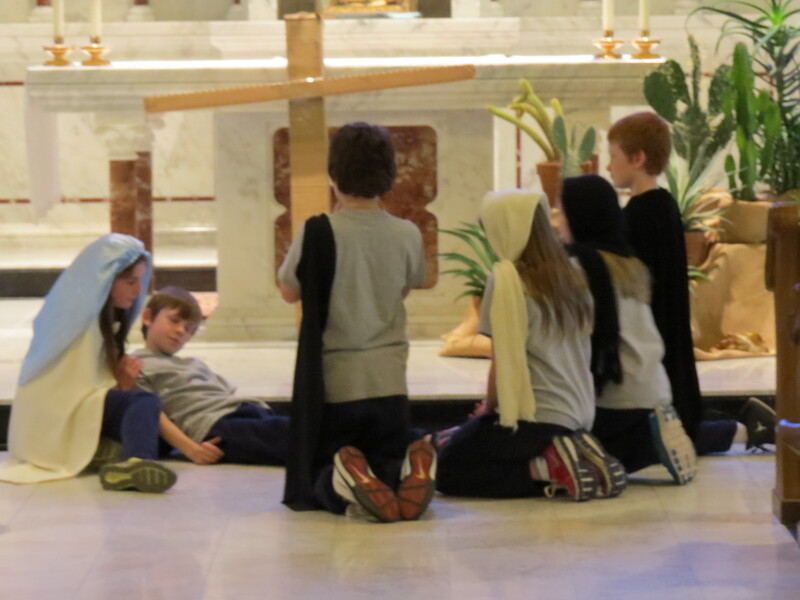 Every Wednesday grades 4-8 are taking turns preparing and leading the school community in the Stations of the Cross. 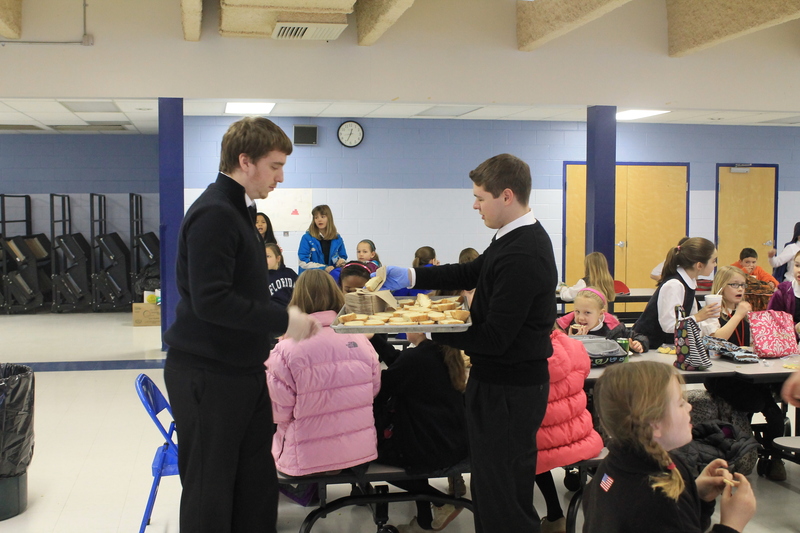 Today, we had a Lenten soup and bread lunch for the students. The faculty put their culinary expertise to use and made all the homemade soups. 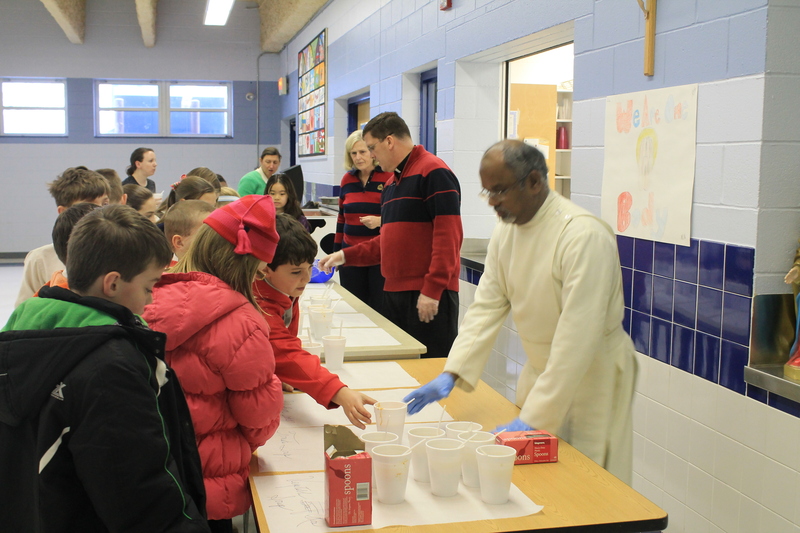 Our priests and seminarians served the lunch meal to the students who enjoyed a variety of soups. 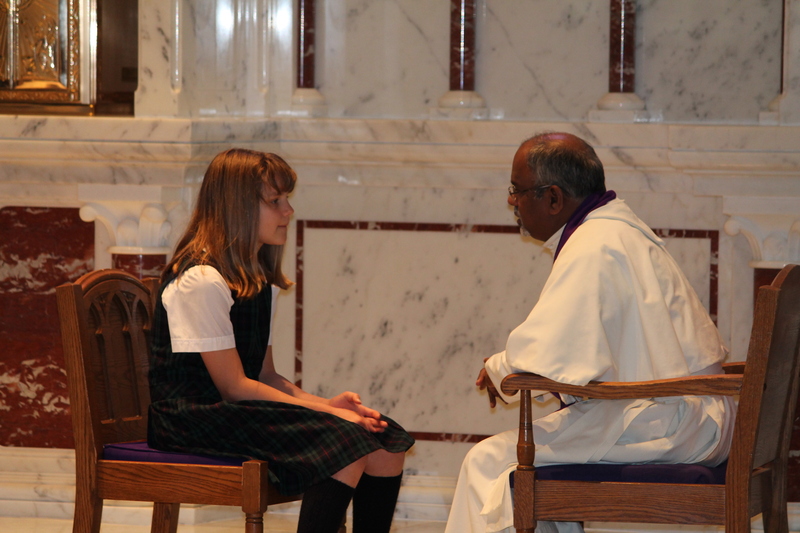 Next week we will receive the sacrament of reconciliation to help prepare us for the great feast of Easter.